The creative process is the story behind countless ideas crumpled up and thrown in the trash,along with those prized few that emerge intact and grow into something new. The process humanizes the product, and is used by all, whether you are an engineer, artist, mathematician or designer. 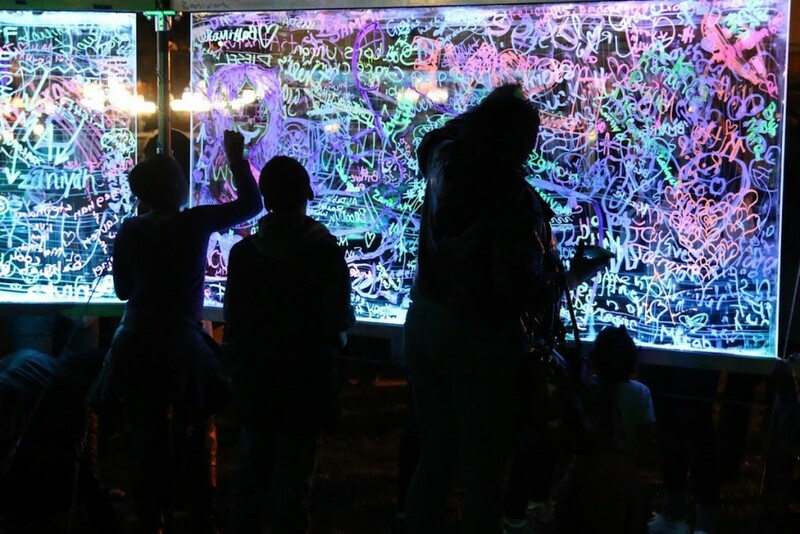 The final product of the Light City Festival has been built from hundreds of individuals moving toward the same goal: to celebrate Baltimore’s multi-disciplinary talent through the core values of Collaboration, Innovation, Audience Engagement, Sustainability, and Transformation. 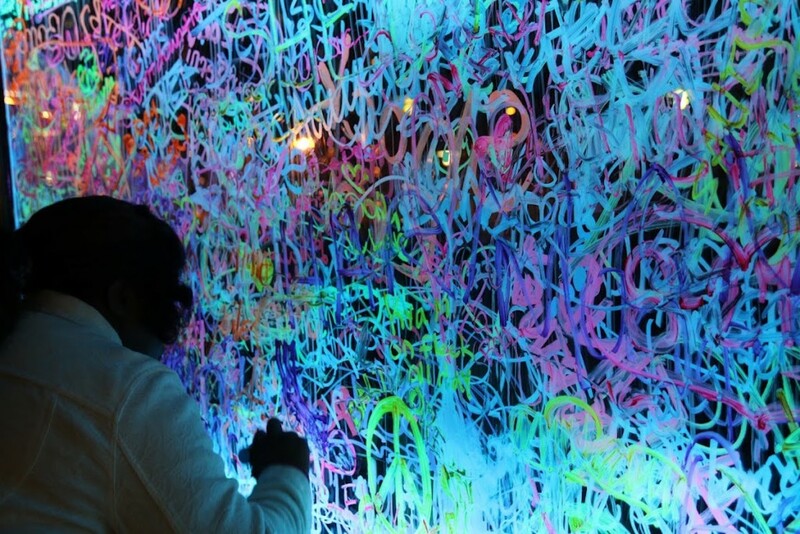 Visual and performing artist Kristin McWharter and physicist Steven Lynam might seem an unlikely pair; they collaborated on Lumen, a hundred-foot acrylic wall installation that spans the promenade in front of West Shore Park, panels of ultraviolet LED lights to illuminate marks made by visitors and guest artists. 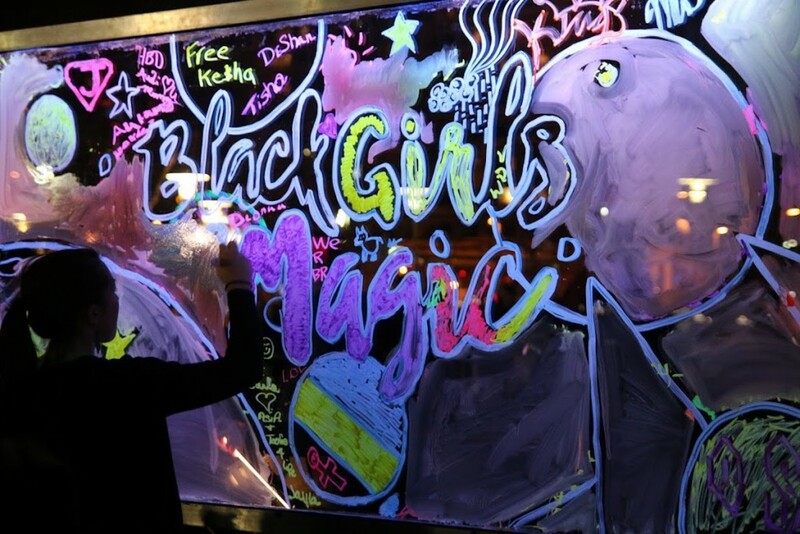 They recognized the opportunity to involve more artists in their proposal, including muralists whose artistic process could be incorporated into the project. Seven guest artists, Megan Lewis with Jubilee Arts Youth, Maura Dwyer, Julia Owens, Gaia, Make Studio, Ernest Shaw, and Gary Mullen, are able to engage the public in a dynamic new way. McWharter notes that her experience working with Make Studio, an art center that provides work space and other support for emerging artists with disabilities, influenced the physical structure. 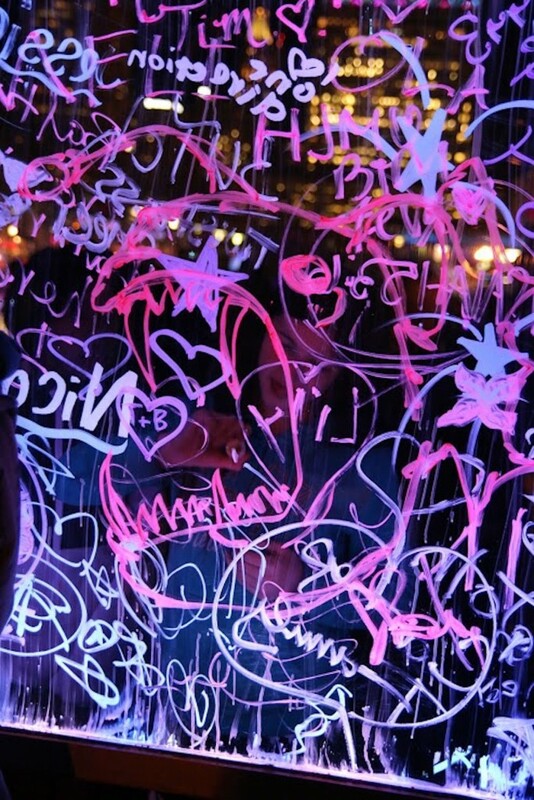 Making a significant mark is what the political artist collective Luminous Intervention does best. Pipelines is a large-scale projection addressing police violence and accountability in Baltimore City through the cases of Tyrone West and Keith Davis Jr., as well as the relevant topics of youth services like education and recreation. The collective emergence during Occupy Baltimore and their creative process is a product of its member’s formal and informal relationships within the activist communities. Luminous Intervention’s inclusion and partnerships with community leaders and organizations are ingrained within their creative process. It is simply how they do art. Pittsburgh-based artist Ian Brill creates immersive, multi-sensory environments by manipulating sound, light and space. His reconfigurable structure is made from recycled materials, and he developed the audio-visual attributes with the assistance of six IT specialists, two AI professionals, a systems administrator, a roboticist and others. The technology and structure inform only part of Brill’s creative process, the other half is more personal, philosophical and experiential. Synesthesia, a neurological phenomenon that mixes sensations and as a result one sense creates an association to another sense (i.e. associating a specific color to a specific word, a taste to a sound), is an important concept behind Brill’s immersive and multi-sensorial installations. The creative process, whether understanding the tangible materials, the realities of a community or personal predispositions, is an experience many can relate to and appreciate. 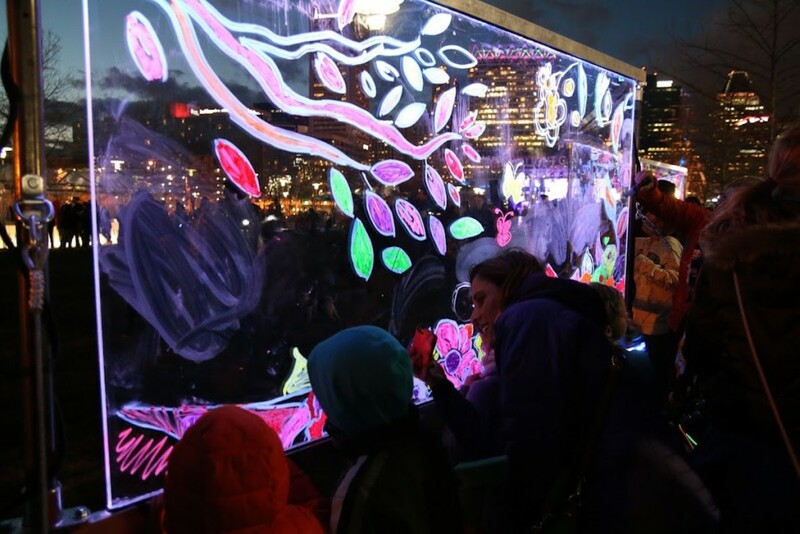 All of the Light City artists are operating beyond their comfort zone, pushing their materials and media, and including others in development and implementation of the final product. The artist’s process is part of human experience, the beauty of overcoming challenges, both tangible and intangible. But it is not just beauty. How can you critically engage in the experience? 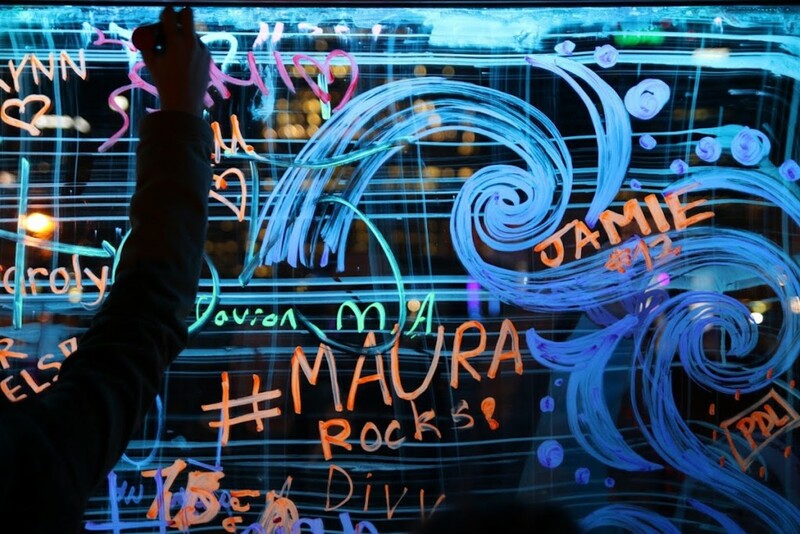 Extend beyond your comfort zone, participate in the art, music and conferences, and experiment in creative ways; treat the Light City experience as your creative process.